By TLex The edgy gets a little edgier! Girard-Perregaux has released a new version of the latest Sea HAWK divers watch with a high-tech black ceramic case. It’s a far cry from the first generation of Sea Hawk models from the 1940s, but makes sense considering the current trend for ceramic watches that we have seen released since SIHH at the end of 2012. 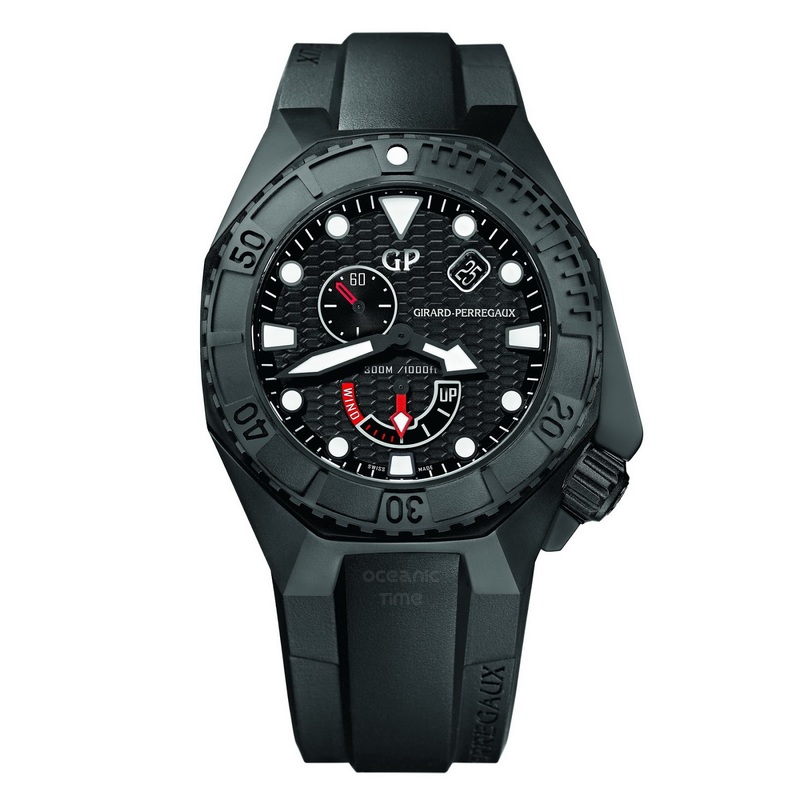 The sleek looking ceramic used for the new Sea Hawk is unchanging, hypoallergenic and heat-reflecting. It is characterized by an extremely fine zirconium oxide powder contained within it. Don’t worry though; its inert character renders it harmless for people and for the environment. An ‘‘infinitesimal dimension’’ makes ceramic possible to achieve a hardness of 1400 HV on the Vickers scale. In comparison Stainless steel has a hardness of 180 HV. It is also extremely scratch-resistant. 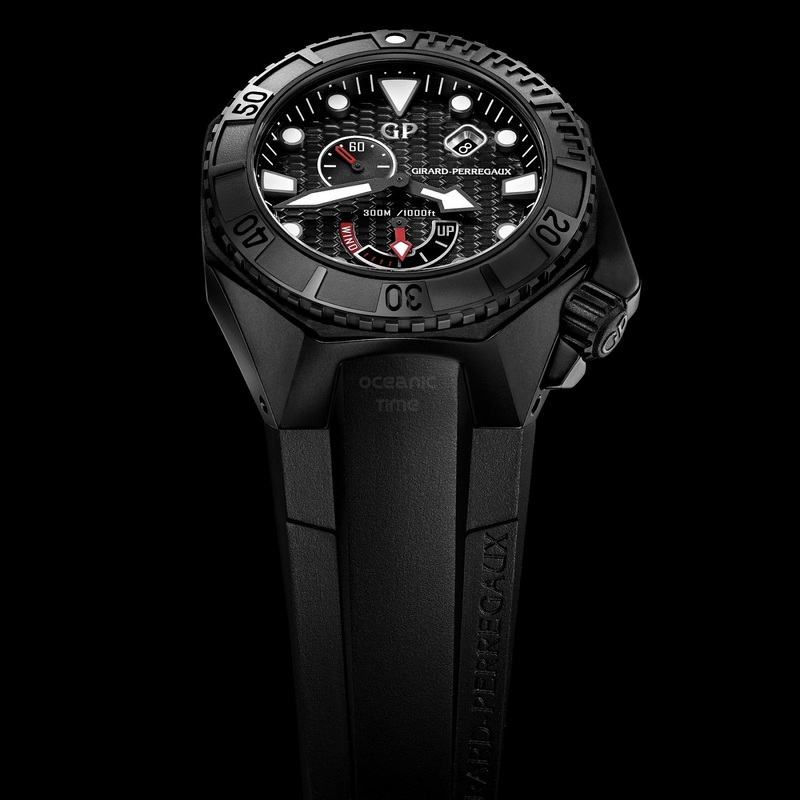 The watch has a real stealth-bomber like personality to it; black and highly angular. The dial offers perfect readability, playing with the reliefs, luminescent touches and layout of the display against a decor inspired by the shape of the Girard-Perregaux Bridge. 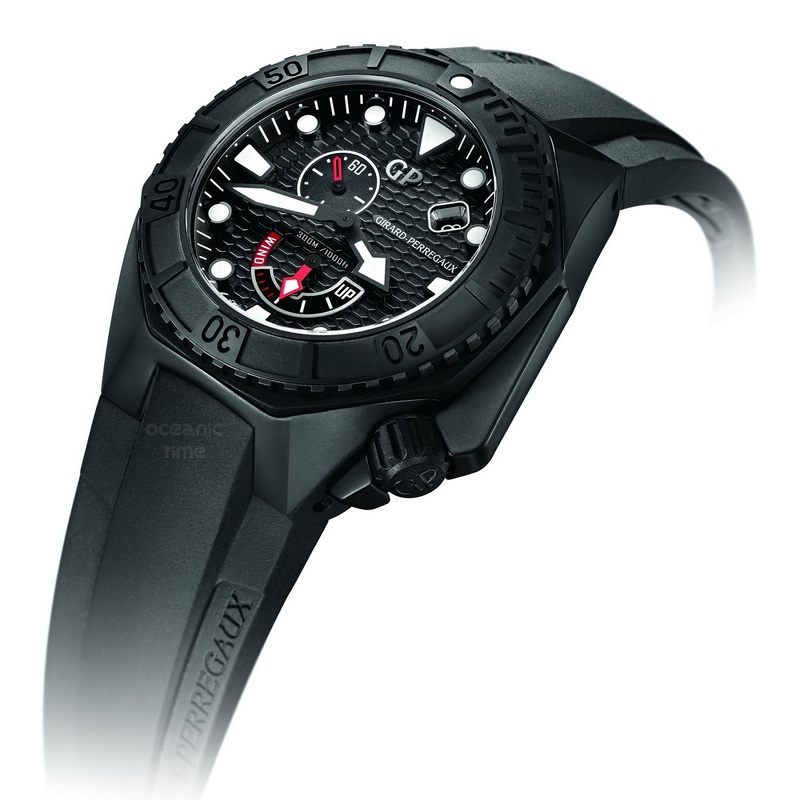 Diving features of the watch include: a unidirectional rotational divers bezel for calculating elapsed dive time, a series of tests to demonstrate its ability to stand up to pressure at a depth of 300 meters, where the watch was subjected to a pressure in excess of 1,500 kg, have guaranteed its water-resistance in accordance with the very strict ISO 6425 standard. The special case construction makes it highly shock-resistant, as does its crown, which is placed at 4 o’clock for greater comfort, reinforced by a crown guard that is perfectly integrated with the case. Its dial is multi-layered. The hour markers and the hands are enhanced with luminescent material. 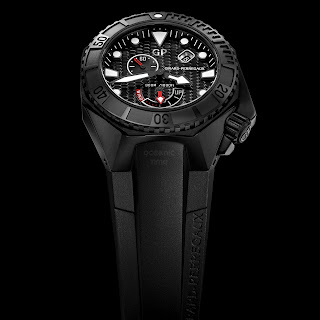 Certain elements are high-lighted in red, such as the hands of the power reserve indicator and the sub-second. The date appears 1:30. Its a little quirky but allows a perfectly balanced display. Finally a Girard-Perregaux Manufacture, GP03300-0074, self-winding mechanical movement with 27 jewels and a power reserve of a minimum of 46 hours, powers this very special watch. 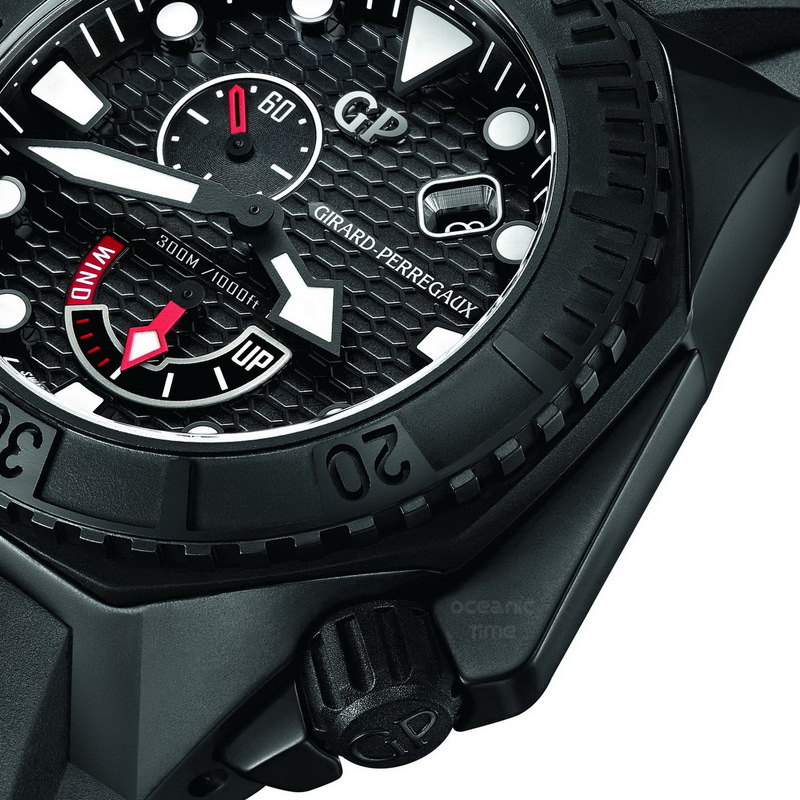 Its functions include: hour, minute, date, small second and a power reserve indicator.